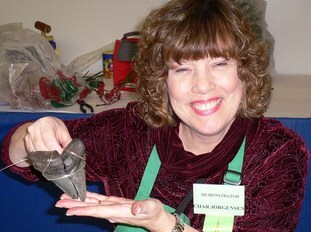 ​I am Char Jorgensen, Master Level Wire Wrapper! I won the title of Master in 2009 at a national competition and I want to pass this craft on to you! Let me give you all the top tips to make this art form easier than pie. I am in Enumclaw, Washington and I teach in two venues near my home. One is Arts Alive in downtown Enumclaw and the other is Ben Franklin in Bonney Lake, Washington. I have been teaching for almost 20 years and have taught nationally at the Bead and Button shows in Santa Fe and Philadelphia for many years. I also teach at my home if students prefer a Private Party! I want to show you how easy wire wrapping is by allowing you to use your stones - the ones that mean something to you - to make a beautiful piece of jewelry to wear or to give! It's really not that hard to do and I provide pages of instructions for you to refer to when you are working on your pieces at home. Plus my phone number and email is provided if you get stuck. Tools - how to make inexpensive tools work like the expensive ones! If you can remember the number 3 - you have got this!